If your holiday wrapping is as chaotic as mine, I am sharing a few gift wrapping station ideas that might help you stay organized. The holidays are a magical yet very busy time of year. There is baking to do, parties to plan, outfits to shop for and gifts to buy. And, of course, holiday budgets to worry about! Staying organized during the holidays is an absolute must! With all of the gift buying that is going on this month, I will soon be neck deep in holiday wrapping. Every year I swear to myself that I am going to set up a gift wrapping station so that my holiday wrapping isn’t quite so chaotic. Buy new holiday wrapping paper since I cannot find the stuff I KNOW I saved from last year. Dig through the junk drawer looking for tape, only to discover that the roll is almost empty. Drag 47 Christmas presents from their designated hiding spot into the kitchen. Swear furiously when several of them drop. Pray those weren’t breakable. Set all supplies on the floor in order to clear off the kitchen table. Retrieve tape dispenser from dog’s mouth. Finally get wrapping paper, tape, scissors, and gifts in the same spot. Sit down to begin holiday wrapping. After the first gift is wrapped, realize I never bought gift labels. Decide gift labels are not really necessary and grab permanent markers to just write names on gifts. Sigh audibly when marker turns out to be dried up and non-functional. Berate myself for not having the ambition and creativity to make homemade holiday bows and creative ribbon decor. Make mental note to Google directions on how to do it. Never do it. Spend 4 hours with holiday wrapping, only to look critically at piles of very badly wrapped presents. Realize that I am only half done and now have to clear off the kitchen table if the family is going to have someplace to eat dinner. Check Pinterest for gift wrapping station ideas only to be overwhelmed by DIY projects that are WAY over my head. Repeat the last 10 steps again the next day….. I saw a ton of really awesome gift wrapping station ideas on Pinterest. They were all color coordinated with the boxes of supplies labeled neatly. There was hardware mounted on the wall and even a motivational message or two tacked onto a homemade cork board. Okay, I am NOT that kind of mom. A holiday wrapping station does not need to be a permanent fixture in my home. I don’t have that kind of room in my house unless I get rid of a kid or tell my husband to give up his music room. I decided that all I needed for a holiday wrapping station was a table in an unused corner of the family room. Add in a few handy supplies and I have a holiday wrapping station that will make all my gift wrapping chores significantly easier. Not to mention the fact that I don’t have to move everything off the table any time people in this house want to eat. Which is like…47 times a day! 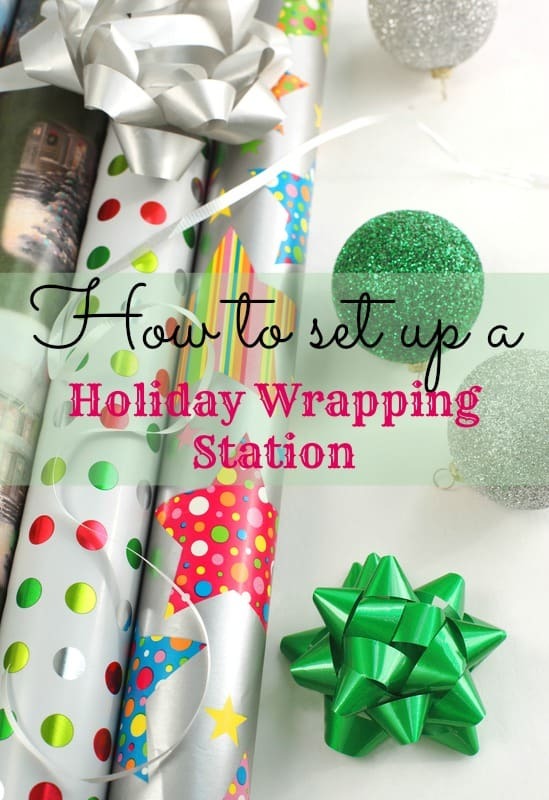 So, if you want to set up a holiday wrapping station in your own house to get ready for Christmas, here are a few useful items you will want to stock it with. Wrapping paper: Stock a wide variety. Add something for kids, one that is slightly more adult looking and at least one non-denominational wrapping paper. Think snowflakes or pretty outdoors patterns. Sharp scissors: NOT the kid safe ones your child keeps in their school box. Bows, ribbons, and ‘bling’ for gifts. If you are really ambitious, make your own. Sprigs of holly or rosemary are a nice touch. Labels. For your own sanity, get the self-sticking variety. Permanent markers. I find the thin tipped ones most useful for writing on holiday labels. Notepad and pens: I tend to write down the gifts I am wrapping and who they are for. That way, I know for sure that I have given people the right gifts and not forgotten anyone. I have been known to hide things so well that I forget where they are and they never get wrapped or sent. Clear Plastic Bins: Keep everything contained in clear plastic bins with lids. Small ones are useful for pens, tape and scissors and larger ones come in handy for wrapping paper. Music: Holiday wrapping is tedious work and the time goes by much faster if you have some form of entertainment. Either set up your gift wrap station in front of the TV or set up a small speaker system to play your iPod on. Coaster and mug of your favorite beverage: You can certainly wrap your gifts without a mug of cocoa or coffee but why should you? 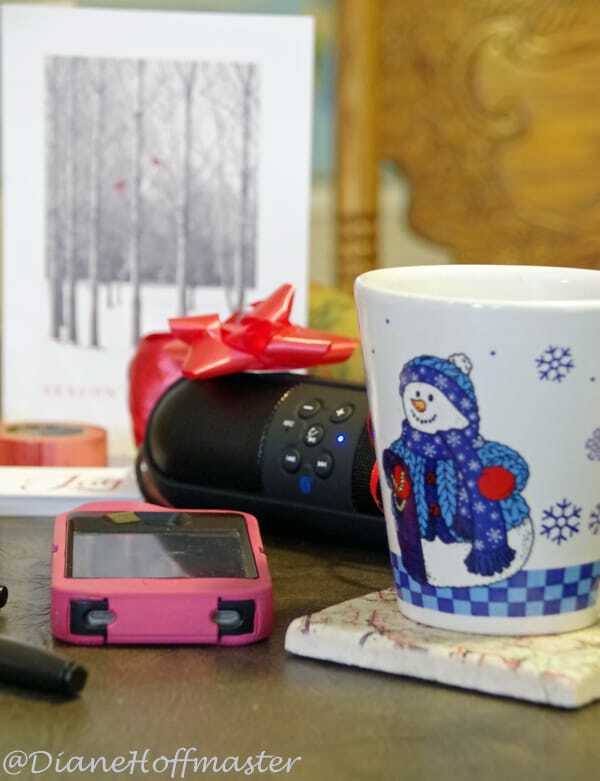 Enjoy a mug of your favorite blend while wrapping gifts for your family. It will make the time go by faster and give you a little bit more energy! 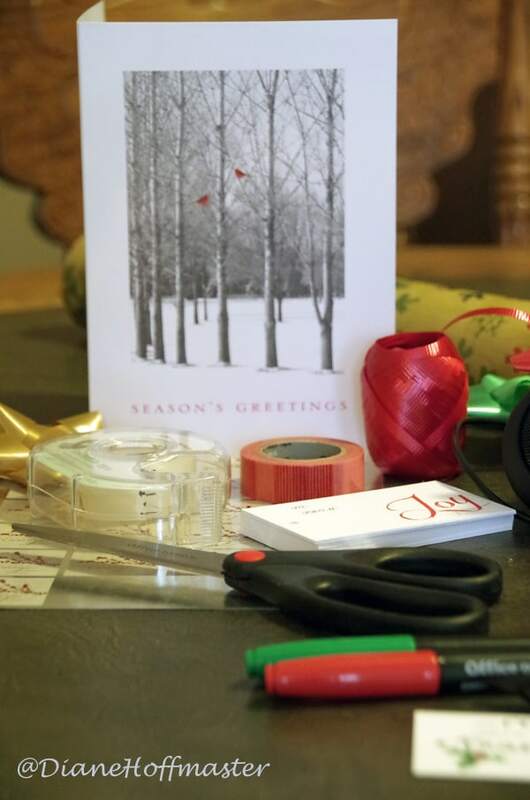 Holiday cards: Don’t forget to send out those holiday cards, too! Stock your gift wrapping station with envelopes, address labels, stamps and everything else you need. Don’t forget to tuck your family holiday photos inside! Wrapping paper can cost a fortune and most of us are working with a budget. Or, maybe you just want your present to look really unique. Either way, here are a few ways to wrap gifts that are a bit more unique than usual. Share these fun gift wrapping ideas with friends so they give YOU fun tins, boxes, bags, etc for repurposing. Use last years wrapping paper: If you can keep the kids from ripping the paper to shreds, try to store it neatly in a large plastic tub until you need it again next year. Use newspaper instead of wrapping paper. The funnies always make a great wrapping for gifts! Wrap gifts in OTHER holiday paper that you turn inside out. You can save paper from birthday gifts, baby shower presents, etc and just wrap your gift with the pattern on the INSIDE. Use markers, paint, crayons or stickers to give it a festive look. Slip your gift into a gift bag. A sturdy gift bag is easy to reuse again and again. Reusable Shopping Bags: We all have a few too many of these around, right? Scarves: Make it part of the gift itself! Old Maps: Perfect for a travel themed gift basket! Set Up a Kids Wrapping Area! Your kids always want to help you wrap gifts, right? And that usually makes things take 10 times longer, correct? Been there, done that! Set up a mini gift wrapping station just for the kids! Let them wrap small gifts (or big ones!) that they make or buy for friends and relatives. Give them inexpensive wrapping paper or let them use a piece of scrap paper from your printer that they can decorate. Or, give them a brown paper bag to cut up and add Christmas stickers to. You can even let them paint with marshmallows! Decorating holiday gifts is a great way to keep kids busy. Just sit your children down with a gift wrapped in a paper grocery bag. 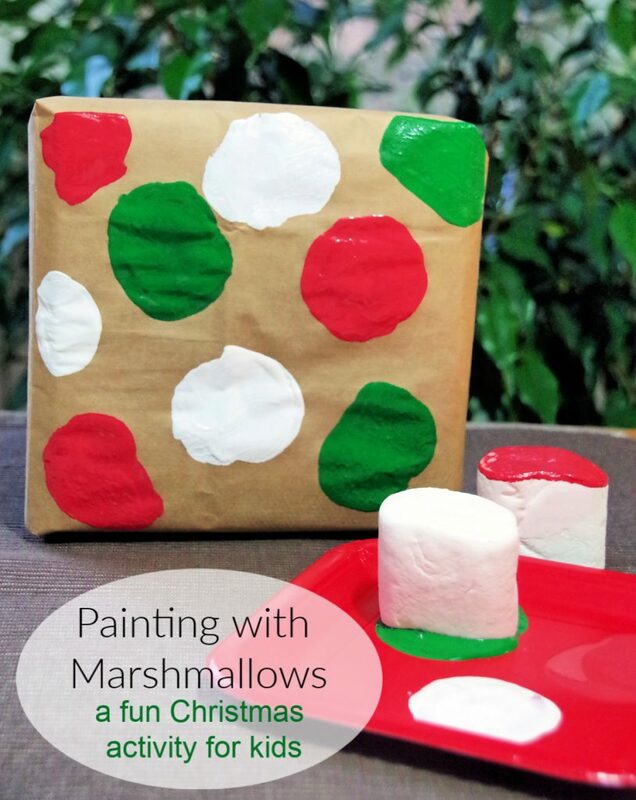 (or let them wrap it themselves, depending on age) Place colorful paint on a paper plate and hand them some large and/or small marshmallows. Ask them to make ‘circles’ on the package to make it look more decorative. Let it dry and attach a small card or holiday ornament to the box. Just don’t let your children eat the paint colored marshmallows! This year, get your holiday wrapping finished quickly and efficiently by setting up a holiday wrapping station. 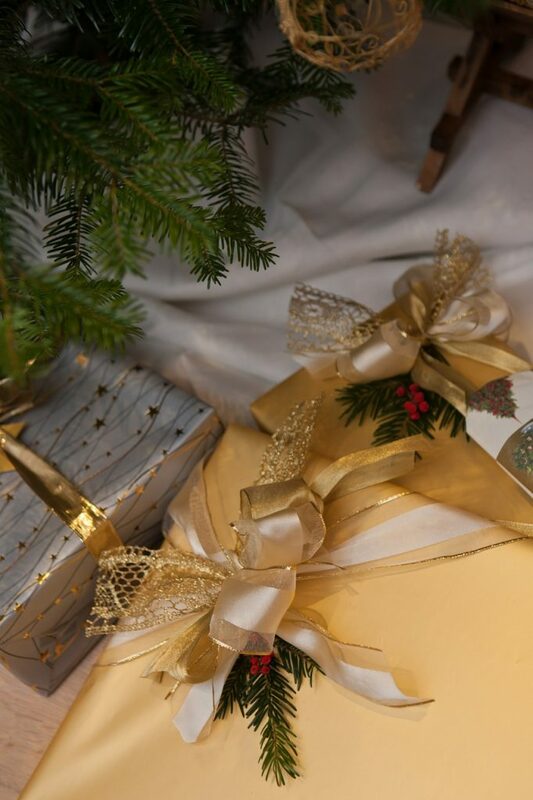 Your gift wrapping will go much more smoothly if you plan ahead and get yourself organized! Have any other gift wrapping station ideas to share? Keeping track of who is getting what and what has been wrapped has saved me from many embarrassing events! 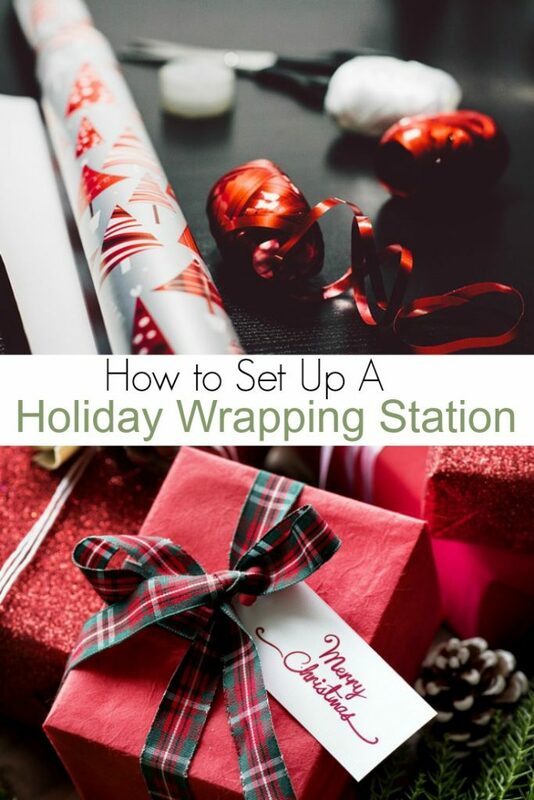 These are all great tips- wrapping is a marathon in our home so having a well organized station like this is essential! I really need to do this. I always have such a mess of a time wrapping gifts.